The Tooth Fairy, Santa Claus, and the Easter Bunny all have problems with their handwriting. They need help with the notes they leave for children in the night, so they've come to Mrs. Holiday's Handwriting School. They know Mrs. Holiday will treat them the same way she treats all her students--whether they are naughty or nice. Fairy is a scribbler, and she writes much too small. Santa scatters soot and cookie crumbs everywhere, while Bunny can't stop hopping long enough to write "Thank you for the carrots." But no problem is too big for Mrs. Holiday! 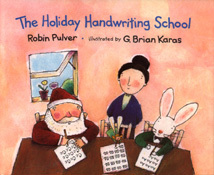 While researching for this story, I discovered that learning handwriting and writing stories have much in common. For both, you need to have patience, keep trying, and above all, RELAX!